One winter, a woodchuck digs himself a nice, warm hole. When he moves out in spring, new animals move in. And so it goes as a succession of animals reuse the cozy den, from skunks to snakes. 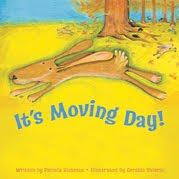 Along the way, the reader learns about the habits and family life of many different woodland animals. The animals have distinctive sploshes of color and elongated legs and ears, and we see them up close and from a distance moving in and out of their temporary home. There are brief explanations of the habits of each animal mentioned in the back. Verdict: A good beginning picture book for learning about animal habitats or just for kids who like animal stories. I divide all my money into categories. Boardbooks, Picturebooks (includes concept books), Easy readers, Juvenile Series, Juvenile Fiction, Juvenile Graphic Novels, Juvenile Non-Fiction, Young Adult Fiction, Young Adult Graphic Novels. (my colleague buys YA nonfiction - I give her suggestions now and then). AV is a whole different kettle of fish. Then I have an Excel spreadsheet for each of those categories with lists and lists of books I want to buy in different genres within those categories. Then I have an Excel spreadsheet for each month with a tentative order list. But my tentative order lists for the rest of the year are pretty much full. And my spreadsheet lists of books I want are waaay too full. Some things are going to have to go so I can start January with a clean (or mostly) slate. So....Johanna Wright's Secret Circus or a new edition of Audrey Wood's Napping House? Greg Taylor's Killer Pizza or Cast's House of Night? Love, Aubrey or Invisible Boy? A nice mixed stack of new books today! When you reach me by Rebecca Stead. I haven't read this (and honestly it doesn't really sound like something I'd like) but there's been so much buzz that I thought we better have it. After some indecision, I decided to put it in juvenile, rather than YA. I'm going to push it to the mystery lovers, but I also added it to the teens mystery reading list. Sisters Club: Rule of Three by Megan McDonald. I somehow missed this new series, but I added it as soon as I heard about it. Pink. Glitter. Cupcakes. Tween girls. What else does it need? Project Sweet Life by Brent Hartinger. More funny boy books! Yay! But why do I always want to say Brett? Mouse Count by Ellen Walsh. I'm not sure the best format for this is boardbook, but that's what was available. Classic counting book. The Great Pie Robbery and Other Mysteries by Richard Scarry. Hurray for reprints! Barack Obama: an American Story by Bob Carlton. Been waiting for someone to publish a balanced biography. So many of the ones I've seen, especially the picturebooks, are very visionary and not at all useful for school research. This had good reviews, and since I can't afford to buy multiple books, had better be good! Cromwell Dixon's Sky-Cycle by John Nez. 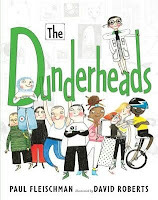 Apart from this being a fun picturebook, it fits in well with the massive inventors project the school kids here do. Although I was a bit taken aback, when our cataloguer, who had looked up Dixon when we were deciding whether this should go in fiction or nonfiction, discovered that he died at the age of 19 while exhibiting his flying machine. "Plunged to his death" is how the source puts it. That wasn't mentioned! Blood Promise by Richelle Mead. For my vampiric girls. That's not my dolly, That's not my car, That's not my lion by Fiona Watt. These boardbooks are all part of the Usborne Touchy-Feely series. The kids love them - our adult service librarian demands that she take home each new one as I get it for her son to go nuts over! Night-Night Little Pookie by Sandra Boynton. Another cute boardbook. These newest editions to easy reader series are classic friendship stories with pleasing artwork. Dancing Through the Snow by Jean Little!! This one came home with me right away. It's the story of a foster girl who has nothing and nobody...but miracles can happen. Kids that love realistic stories will enjoy this one. Some of my favorite books are what I call small town adventures. They're set in an older, more innocent time when kids could sneak out at night for adventures and build marvelous inventions in their backyards. Some of the best are the Mad Scientists' Club by Bertrand Brinley, Secret Agents Four by Donald Sobol, and the White Rose Rescue by Astrid Lindgren. Although some have tried to recapture this genre, it never quite works. Until now. Eleanor Davis has taken a classic genre, added some new elements, and captured the entire work of genius in a graphic novel. Loving but not-in-the-way-when-they're-not-wanted parents? Check. Individual and well-drawn characters than transcend stereotypes? Check. Gorgeous and detailed art? Check. An adventure everyone will love? Double check! Verdict: The smaller print will put off some children, but most will love this fun adventure that flips stereotypes and throws adventure, glue, and flying machines around in equal measure. Somehow I've never read anything by Shutta Crum before. I don't even recall hearing her name (and I would have remembered, don't you think?). Now I'm wondering what I missed, because I think this is going to be a classic! It's a hot and humid day on a midwest farm, until clouds begin to gather. It's a thunder-boomer! A giant storm that sweeps over the farm with thunder, lightning, torrential rain, and hail. When it's all over, they find something special out by the barn. The language is evocative and lovely, but retains plenty of action and fun sounds for children to enjoy. There's genuine tension in wondering if the hail will damage the crops, but it doesn't detract from the family's appreciation of the cooling and majestic storm. 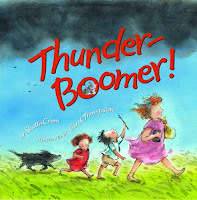 A perfect read-aloud for hot summer days, or for kids feeling a little scared of a big storm. Carol Thompson's illustrations are a great match for this fresh story. Her mixture of materials and techniques gives a realistic and textured feel to the illustrations and is perfect for showing the evolution of the storm. But New Books Make Everything Better! Poppy and Ereth by Avi. I'm not sure we have the entire series, but I thought it was important we get the final story. Faith Hope and Ivy June by Phyllis Reynolds Naylor. Some tween girls have asked me for more realistic girl fiction, and this looked like a good choice. Teen Knitting Club by Jennifer Wenger. This was a choice of our adult services librarian for the teen nonfiction collection. Very snappy cover. Pearl and Wagner: One Funny Day by Kate McMullan. A good easy-reader series. Lost and Found: Three Dog Stories by Jim LaMarche. The soft, warm art and happy-ending stories will make this a favorite - a good bedtime story and dog lovers will like it too. Dinotrux by Chris Gall. Finally, finally, fit this into an order! Dinosaurs! Trucks! Need I say more? A Hole in the Road by Jakki Wood. Lots of machines and construction processes for young fans. Henry and the Crazed Chicken Pirates by Carolyn Crimi. Look at that cover. Who wouldn't want to read this? Katy Did It by Lorianne Siomades. Joyously eye-popping art and great repetitive text for storytime. Down Down Down: A journey to the bottom of the sea by Steve Jenkins. It's Steve Jenkins. It's gorgeous. A look at the ocean, level by level, from the air to the deepest trenches. Bird, Butterfly, Eel by James Prosek. An excellent explanation of migration for young children with lovely nature art. The Road to Oz: Twists, turns, bumps and triumphs in the life of L. Frank Baum by Kathleen Krull. I'm beefing up our biography section, this is an excellent addtion. Wanda Gag: The Girl who Lived to Draw by Deborah Ray. I heard mixed reviews on this, but I'm glad I got it. The text is long enough for the older kids on their biography assignments during the year and the illustrations will attract younger readers and their parents. 8:30 - 12: Arrive at work. Work on filling in back to school displays. Tackle detritus of juvenile nonfiction weeding. Carry prizes over to community room. Move a few tables. Greet new aide who is being trained by current-but-soon-to-be-previous aide (who is going to college). Call Parks and Rec to reserve community room for fall programs. Talk to Parks and Rec about their Baby Sign program (we don't want to overlap). E-mail colleague the go-ahead to plan ours. Adjust fall brochures. Pass fall brochures out for review by staff. Continue juvenile nonfiction weeding. Shift juvenile nonfiction shelves. Shelf is stuck! Spend a while banging on it with aid of aide and accompanied by irritated looks from patrons at computer. Finally get it unstuck. Pull down all the old window art from summer reading. Organize prizes in community room. Grab something to eat. 12 - 2: On reference desk. Help girls find books on gymnastics. Help little girl find chapter books (put Cowgirl Kate and Cocoa and Cork and Fuzz on hold). Enter computer reservations for four people. Computer crashes, b/c someone tried to use Adobe on it (which it doesn't like). Poke around on computer. Poke around some more. Wander around library looking for people who have reservations. Talk to director about getting new computer system and replacing horrible computer-which-crashes. 2 - 3:45 Continue juvenile nonfiction weeding. Show off "I can be a computer operator" complete with 1980s keyboards to colleagues. Discuss weeding with director. Finish entering stats from summer reading program. Help aides move tables and chairs for grand prize drawing in community room. 4:10 to discover approximately 85 people milling about the community room, our face-painter has arrived, and the kids are getting bored. Hastily bring in ice cream, aides, director, and adult services librarian start scooping, I get the kids' attention with the aid of a teacher (I'm a librarian. I have a library voice.) and tell them to line up for ice cream and look at the prizes. 4:30 - 5:00 Draw for prizes. We have 2,000 drawing slips and 36 prizes. Kids enjoy taking turns pulling out names, but more than half of the winners aren't there. My top five readers all won a prize as well as several others. 5:00 Face-painter generously agrees to stay later and finish the line. Encourage kids to finish ice cream. Crying kid (there's always one) is born off by parent. Aides clean up (you guys are great!) while I lug all the prizes left back to my office out of sight. 5:30. Everybody finally leaves . Help face-painter carry equipment out to car. 5:30 - 6:00. Type list of names of winners who weren't there, post list at reference desks (people will hear from friends they won a prize and many will call and ask if they won). Move all prizes to closet by youth reference desk so they're accessible. Discuss cataloging of Boys of Steel by Nobleman. Biography - but then which person? Nonfiction - 741s? 6:00. Go home. Collapse. Remember thankfully that I work 12 to 8 on Wednesday. Remember that I'm going to have to call all the prize-winners. I hate making phone calls. See? I can be grumpy if I want to. Phew. Summer reading is officially over! We had 200+ more kids sign up than last year, and I made a few changes to how the program worked last year - this year, kids got a free book when they registered and a small prize and drawing slip for each two hours they read. We had approximately 2,000 drawing slips - that's 4,000 hours of reading! We had 36 grand prizes (and face-painting and ice cream). To sum up: the face-painting was amazing, the kids who won prizes were thrilled, much ice cream was eaten, and the kids enjoyed pulling names out and seeing who won. 1. 2,000 drawing slips. You know how long it takes a six-year-old to write his name and phone number? 3. Upset parents whose kids didn't win a prize. 4. Parents who want only kids at the drawing to get prizes. 5. Parents who want kids to be able to write what prize they want on their drawing slip. 6. Because they won't be at the drawing and what if their kid's name gets drawn? 7. Yelling names out over 85 talking kids and parents. 8. Disappointed moans when a name is called and the person isn't there. 11. They're already getting prizes, my budget can't take it (I had very few donations this year) and I don't like the prizes to outweigh the reading. 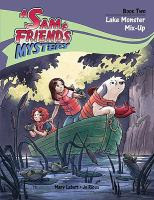 I actually received the second Sam & Friends Mystery, Lake Monster Mix-Up, for review, but couldn't figure out what was going on with the talking dog, so I dug around and borrowed the first from another library in our consortium. 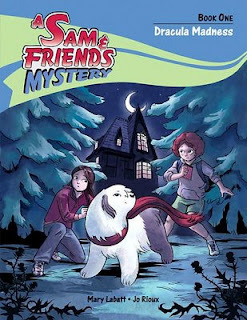 In the first of these two graphic mysteries, Jennie is sad because her best friend, Sarah, has moved. A new couple has moved into Sarah's house and they don't even have any kids! Instead, they have a big, shaggy sheepdog, Samantha (Sam for short). Jennie and Sam quickly become friends, especially after Jennie discovers she has "the gift" and can hear Sam's thoughts. Sam eggs on Jennie and their new friend, Beth, to discover the mystery of the mysterious Mr. McIver and his creepy house. In their second adventure, Sam, Beth, and Jennie are off to a boring weekend by the lake. But with Sam along, they quickly discover an old diary and a creepy mystery! There's nothing particularly new about these stories; both use well-worn plots for children's mysteries; the creepy old hermit who hates people but likes animals and the mysterious lake monster complete with warning from a local. The text is all dialogue and the art is expected to convey all the action and emotions. This leaves quite a few loose ends in both stories; in the first, we never find out how Jennie feels about the complete absence of her old friend Sarah, where Beth came from, or why they weren't friends previously. In the second story, the local's mysterious warning and the clues in the diary peter out into nothing; even the characters wonder at the end what they meant and hint at a possible explanation in a sequel. Verdict: So, these are boring, cliched stories, right? Nope. They're actually quite good and I enjoyed reading them. The art is black and white with crisp, clean lines and does an excellent job of filling in the story behind the dialogue. Sam provides a dash of humor and a unique hook for the story; Jennie's ability to hear Sam's thoughts is perfectly done and fits naturally into the story. These are excellent mysteries for readers ready for beginning chapters who aren't yet interested in a lot of character development and emotional exploration. These readers will be looking for a story that feels familiar with humor, fun characters, and an exciting plot and these graphic novels are the perfect match. 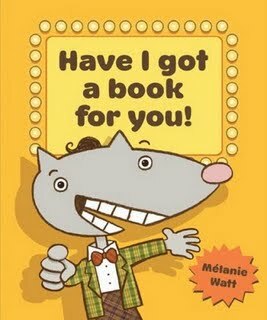 Recommended for juvenile graphic novel collections that include younger readers in their audience. When I heard Melanie Watt had a new book coming out, I was delighted. I have long been a Chester fan; he is a staple for all my school visits and tours, and I frequently recommend Scaredy Squirrel. I got my first glimpse of Watt's newest story when I was at ALA last summer. My first thought was...but...but...it's not pretty! And it's definitely not. The color scheme is a revolting orange, green and brown and the main character - the only character - is smarmy, oily salesman Mr. Al Foxword whose whole aim is to pressure you, the reader, into buying the one thing you desperately need: this book. Like Mac Barnett's delightfully illogical picture books, Billy Twitters and the Blue Whale Problem and Guess Again!, this book is wasted on the toddler and preschool crowd. Some kids might pick up a few jokes, but the ideal audience is a group of second graders who have just figured out the whole concept of "subtle humor". Verdict: An older audience is going to pick up on the parody of a pushy salesman, offering useless incentives, weird uses, and all-out hilarity as Mr. Al Foxword convinces you to buy his book....one way or another! Jan Thomas is not exactly a newbie - she's been delighting the toddler crowd (and those older) for some time with such scary delights as The Doghouse, word play in Rhyming Dust Bunnies, and responsive reading in What Will Fat Cat Sit On? But I feel she has reached her zenith in Can YOU Make a Scary Face? An apparently giant bug encourages the reader (or listener) to use their imagination....but sometimes your imagination can get out of hand! Like Thomas' other books, the text and illustrations are deceptively simple, with bright, bold colors and heavy black lines. Verdict: This is going to be a wow in storytime - I'm kicking off my programs with it this fall! Faceless Ones by Derek Landy. Ok, I know it isn't released until August 25th. But why hasn't it come yet? I ordered it in July! I absolutely cannot wait for the newest Skulduggery Pleasant. Are the Faceless Ones going to return? Will Ghastly Bespoke become human again? What's going on with Stephanie's mirror doppelganger? Boy Dumplings by Ying Chang Compestine. This sounds like a hilarious and clever picturebook and I am very impatiently waiting for someone to get it so I can borrow it! Night's Edge (anthology) with Charlaine Harris etc. I love paranormal/mystery/romance short stories. This has been out for a couple weeks but it doesn't look like any libraries in my system plan to get it. Sniff. Dinosaur Hunt (Max Spaniel) by David Catrow. Now, I am not a HUGE fan of Catrow, but a mildly enthusiastic one. But good easy readers are sooo hard to find and this looks like a winner! Psych major Syndrome by Alicia Thompson. I admit it. I just want to read the ending. Obsidian Prey by Jayne Castle. I like this series. So there. I discovered S. A. Wakefield's classic Australian children's nonsense last year, when I first read Bottersnikes and Gumbles. "That was lovely" I thought. "Pity there aren't any more". Then a little Bookmooch wishlist popped up on my email. Gumbles in Summer. Oh, the delight! Took a little while to get my hands on this book, but I am so happy it is here! It's hot. Very, very hot. Australian bush hot. Even the Bottersnikes are getting irritated (or more irritable than usual). With delightful humor and insane logic, the Gumbles and Bottersnikes interact through seven connected stories as the Bottersnikes try to catch the Gumbles, select a new king, and cool off; without shrinking in the water. Meanwhile, the Gumbles just want to enjoy a splash and paddle in the pond they have built; and maybe play a few tricks on the nasty Bottersnikes. Verdict: These sound like they should be cutesy and boring, but the odd details and fresh humor keep the stories silly without being insipid. Delightful read-alouds or summer reading for kids who like a little nonsense. 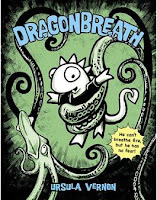 Danny Dragonbreath is the only mythical creature in a school of reptiles. He and his best friend Wendell (an iguana) are at the bottom of the heap, constantly bullied by Big Eddy the Komodo dragon and his dreepy friends. Danny also hasn't quite managed to breathe fire yet. Uh-oh. Danny has one chance to rewrite his report. And who better to help than his Cousin Edward, who just happens to be a sea serpent? Danny and Wendell are off on the ultimate adventure undersea, where they'll encounter artistic octopi, vicious sharks, massive whales, the Kraken, and a host of other exotic, gross, and terrifying creatures. The story is told in a mixture of green and black comics and text, each blending smoothly together. The wacky humor and factual information is excellently and smoothly mixed. Verdict: Hand this to fans of Captain Underpants, kids interested in the ocean, comic-lovers, and fans of Cressida Cowell. This review sounds rather bland but...seriously this is an AMAZING story! I've actually had this for a while, but I didn't want to read it until I had collected the appropriate lollipops to accompany it. I have a thing for lollipops; not the boring ones in the grocery store, but the really fancy ones, swirling colors and at least a foot long. Anyways. First, the bad. This seems to be a characteristic of small press collections of stories, but it never fails to irritate, puzzle, and enrage me. Typos! Obvious spell-checker typos! Grrr. It totally breaks the flow of the story, like in "I Knew a Guy Once" (pg. 7) "I'm not glad see you though". Notice something missing? And there should be punctuation after "his food allotment" on pg. 9. Altogether, it works out to about one error per story. Say, Ms. Huff, I'd be happy to volunteer to proofread your next collection b/c it doesn't look like anybody else is bothering. Ok, that's out of my system. Now, the good. Awesome stories, including several I hadn't previously read about well-loved characters - Tony (not one of my favorites, but I know he's got fans), a Torin Kerr story (yay! ), and a Keeper story! !, a Terazin story I hadn't seen before (yay! ), and a Magdelene story which I already have, as it was including in Stealing Magic. Not that I'm complaining! And all (I think?) of Huff's Valdemar stories, which I'm pleased to see together. I loved "Slow Poison" the steady build is absolutely perfect. "Tuesday Evenings, Six Thirty to Seven" was both hilarious and heart-wrenching. Lots more great stories, but those are what stood out to me. Verdict: Fans of Tanya Huff will be happy to overlook the typos and scoop up this fun collection (although I gotta say, if it's gonna have typos in it it's a bit over-priced). This is an...odd book. It's a little too long for a picture book, but a little too short for a beginning chapter book. It doesn't have enough illustrations to be a graphic novel, but too many to be regular fiction. It has a Dahlesquian teacher but other than her legendary horridness, we don't find out anything about her. It has an army of children with unique talents, but we never really discover anything about the narrator, other than that he is good at planning and likes chess. It has a triumphant conclusion, wherein the underdogs are...well, triumphant, but no clues as to the consequences of their daring actions in the future. It has the broken-off feeling of a series, but I have difficulty imagining future adventures. 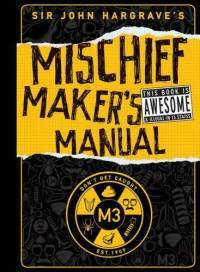 Verdict: We catalogued it in juvenile fiction and it has checked out several times since it arrived a few weeks ago. So, good? Where do you send a teen who really, really wants to write? So I have this patron, with whom I am rather good friends. She is just turning 13, is a voracious reader (of fantasy and manga), and really wants to write fantasy - she's already writing a humongous fantasy novel with a friend (she told me all about it). So far, I've given her Patricia C. Wrede's Worldbuilding Questions, Victoria Hanley's Seize the Story (which she said was amazing! I agree! ), and I've just requested Gail Carson Levine's Writing Magic. She has discovered fanfiction.net on her own and is very excited about that. What I'm looking for now, is some kind of current publishing information directed at teens. She said she looked at some publishing information and it was very "confusing". I know I found a website about this at some point in the past that was excellent, but I can't find it again! Any suggestions? I don't want to discourage her enthusiasm, but I do think she needs something, well, practical. I've been looking forward eagerly to Steve Sheinkin's newest history book for quite some time. Although I was personally a little disappointed with Two Miserable Presidents, I thought King George: What was his problem? one of the best middle grade history books I've read. And now Steve Sheinkin has done it again. Which Way to the Wild West? is a balanced, cohesive, enthralling story of America's westward expansion. The story covers famous events, such as the Donner Party, discovery of gold at Sutter's Mill, Battle at Wounded Knee, and the life of Chief Crazy Horse, as well as lesser-known movements, such as the Exodusters, Ghost Dance, and a fascinating look at the building of the trans-continental railroad. Loaded with original sources and quotations, personal stories, battles, and the struggle to survive of many different people, this overview will only whet reader's appetites for more. Interspersed with fun illustrations, and humorous captions, this is the perfect book to introduce a reluctant reader to history. The sources and bibliography are arranged simply and efficiently for readers who want to find out more about the various personages and events. Verdict: Highly recommended for reluctant readers, students interested in western history, or anyone who likes a good story! I can do it myself by Diane Adams illustrated by Nancy Hayashi. I like the funny disconnect between the child's determination to do everything themself and the results. The pictures are a bit in the style of Henry Cole. Goldilicious by Victoria Kann. I bought this because I have a bunch of little girls who are huge fans of Pinkalicious and Purplicious. Personally, if one is going to hand out fancy princess picturebooks, I prefer Fancy Nancy. I find Kann's art flat, the mixture of pink, purple, gold, glitter, and unicorns sickly sweet, and the writing style boring. But that's just me. Roawr! by Barbara Joose illustrated by Jan Jutte. I love stories that have interactive sounds. I tried this one out in storytime right after I got it and the kids "roawred" along quite happily. I really like the writing style and odd words too - very chewy. Homegrown house by Janet Wong illustrated by E. B. Lewis. Warm, beautiful story about a little girl wanting to settle down in a well-loved house. Beautiful illustrations. Pond Circle by Betsy Franco illustrated by Stefano Vitale. The life cycle of a pond told in a cumulative narrative after the fashion of This is the House That Jack Built. The illustrations glow with life. We're all in the same boat by Zachary Shapiro illustrated by Jack E. Davis. I had several patrons who teach Sunday School in mind when I bought this. It's a fun and silly abc book based on the story of Noah's Ark. The illustrations are hilarious and one of my patrons scooped it up for a Noah's Ark lesson this Sunday right away! Star Wars Clone Wars Crash Course. This is a new clone wars comics series. I tried to find it in prebound, as these tend to fall apart after a few gentle handlings, but no luck. My 8-12 boys are crazy about these and gentle handling they do not do. Baby-sitter's Club: Claudia and Mean Janine. This is the last (as far as I know) of the baby-sitter's club graphic novels. We have all four now and they check out regularly, although they're not as popular as Babymouse or Bone. Fancy Nancy and the dazzling book report. Couldn't find this easy reader in hardback and had to settle for pb - I know I'm going to have to replace it in a few months. Mercy Watson: Something Wonky this way comes by Kate Dicamillo. The newest Mercy Watson. Bad Girls by Jacqueline Wilson (audiobook on cd). This came in from an audiobook order our director put through. Wilson is quite popular here, so it should check out, although the kids have become enamoured of playaways, so cds are less popular. How to get rich in the California Gold Rush by Tod Olson. An interesting juvenile nonfiction. It's the story of a fictional young man going to the gold rush - tons of little facts and boxes of information, and short chapters plus info at the back about how the fictional story matches real life. Inked by Carey Hart. One of those really fascinating teen browsing books - if you're into tattoos. The Zombie Survival Guide by Max Brooks. I thought this sounded funny, apparently it's very popular - had a hold on it right away. Mehndi by Carine Fabus. We just had a henna program in July, this was supposed to be here then but got backordered. Sigh. Dorm Room Feng Shui by Katherine Olaksen. It feels a bit feminized for my taste, but then I can't think of any guys I ever met in college who would have wanted to feng shui their dorm rooms. And Coffin Club by Ellen Schreiber. I'm trying to get this whole series - we're still short a few. And now that I've put new stickers on them, marked them off the order list, added them to the new posters, added them to the youth services blog, put some things onto the reading lists, added stuff to the lexile lists....they can go on the shelf! I didn't like it. It pushed all my buttons and I am very grumpy at it. I will just say that I grew up with multiple teasing/tormenting brothers and their friends, spent one year at a "prank" school where if you didn't think pranks were funny you were jumped on by everyone (even if YOU were the person cleaning up the mess in the cafeteria or having rotten fruit thrown at you during a skit) and have spent a large portion of my life cleaning up after people, from tagging along with my mom to clean filthy duplexes at the age of four, to cleaning businesses (who knew there could be so many dead crickets?) house cleaning and said cafeteria cleaning, to scrubbing vandalism off windows and plugged toilets (who thinks an orange in a urinal is funny?) at my library. I am not amused. Yeah, yeah, I know these are all supposed to be "clever" and not just "gross" or "destructive" but the bigger pranks all leave a mess, the smaller ones leave the other person looking stupid, and I don't care what advice the book gives, you think any kid is going to take safety precautions or think ahead? 9 out of 10 won't. Verdict: I checked this out from my library consortium because I was considering purchasing it for my library, which I do not intend to do because of the many double-page flaps and because of not wishing to make our community's problem with vandalism worse than it already is. Plus, my own personal prejudice. Hey, being honest here. If Jacqueline Wilson's Cookie is a fluffy fairy tale with extra frosting, Karen Day's Tall Tales is a healthy loaf of bread. Meg's family has moved yet again and she's having trouble, as always, making new friends. Especially since she can't seem to stop telling stories. Or are they lies? But it's better to make something up than tell people what's really going on in her family. When she finally makes a friend, she starts seeing what life could be like. But will she and her family have the courage to make changes? This story of a family suffering with an alcoholic and abusive father doesn't sugar-coat the pain or demonize anyone. Meg and her family love their dad and they have good times and wonderful memories together. Meg's mother loves her family, but has made some bad decisions over the years and is suffering for them. As Meg and her family begin to break the silence that has imprisoned them, they begin to grow and change and hope. There are no easy answers and completely happy endings, but there's courage and a will to change. Verdict: A good story for tweens who like strong realistic fiction that's not too graphic. Eva's birthday present is a box...but not just any box. 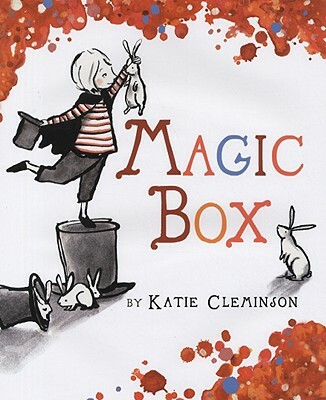 A magic box, one that can make her a magician. With her new magic, she creates a friend called Monty and the most wonderful birthday party ever! The illustrations are what really grabbed me. The basic characters are in black, white, and gray, with faint touches of reds. Around, over, and behind them, magical splashes of color represent Eva's new-found magic and her delight in her wonderful birthday present. Verdict: Perfect for preschool storytime, bedtime, or a special birthday present!